Black Diamond calls the Sabretooth their most versatile crampon, suitable for travel from Denali to Ouray and everywhere in between. 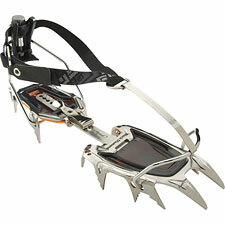 The Sabretooth is an aggressive 12-point steel crampon capable of getting you across a glacier and up a mixed route. While the Sabretooth is certainly a climbing crampon first and foremost, it is also a competent performer for glacier crossings or traversing across a snowfield. The Sabretooth is available in two models: Clip and Pro (2lbs, 2oz). The Clip features a "new-matic" style binding for boots without a toe lug. The Pro offers a fully automatic clip-on binding for ski boots and plastic climbing boots. Black Diamond has tweaked the point placement and design to make either model a formidable climber. I especially liked the extra emphasis on horizontal area, which allows more secure placement when climbing using French or flat-footing (across the fall line) technique. The extra sub-points at the toe add shear stability (especially in softer conditions) while also allowing you to set a more stable platform when front-pointing up ice. The points are also subtly serrated for added stability on bare rock. Both Clip and Pro versions of the Sabretooth ship with a removable ABS plate to reduce balling/sticking of snow beneath your boot. In both versions, the length of the Sabretooth is easy to adjust without tools. The overall length of the crampon is first set by adjusting the center bar. Then, you can fine-tune the fit to your boot by rotating the dial on the heel piece. I found the fit quite firm when using the Clip version on Sportiva Trango boots. It was easy to put on and take off the crampons, and I did not experience any unwanted shifting or rotating. As a steel crampon, the Sabretooth weighs more than an ultralight aluminum model, but Black Diamond has updated the Sabretooth by shifting to stainless steel, which is lighter. If you know you're going to be on technical rock or ice, the Sabretooth's steel points are positively a joy to use, with a firm, solid bite even on waterfall ice. Really, the only limiting factor with the Sabretooth is the boot you clip them to. These versatile crampons are ready to tackle just about anything, including glacier travel, making them one of the most popular steel designs on the market.